If you’ve ever wandered into a gym, only to see a few muscular people grunt and drop a 300 lb. bar, you probably understand gym anxiety. Many people avoid going to gyms altogether because they feel uneasy, uncertain, or anxious. But why is that? 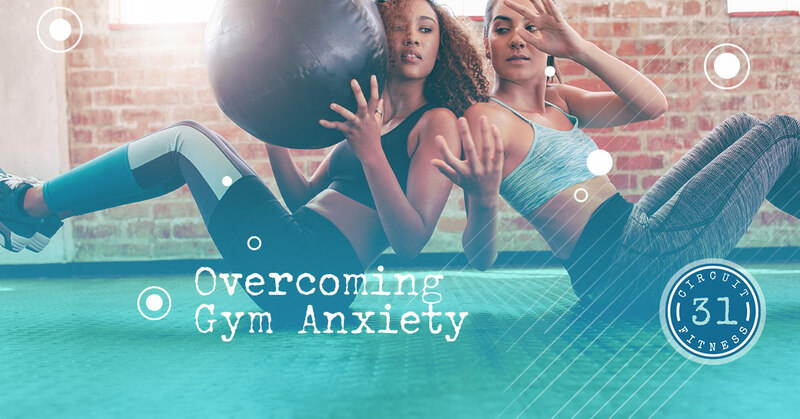 Today, Circuit 31 Fitness wants to help you understand your gym anxiety so you can move past it. Let us help you get your workout in confidently. At the core of it all, there are four main causes of gym anxiety. You feel uncertain of what to do or where to go. You compare yourself to others and feel disappointed that you are not where they are. You feel as though everyone is watching you and judging you. You don’t feel as if you belong in the gym. Today, we are going to discuss each of these fears and how to overcome them. This is a problem both physically and mentally. Physically, uncertainty is when you don’t know what to do. That equipment looks complex; how do you use it? When you don’t know what to do, chances are you’ll stick with something simple and get an ineffective workout in. However, the uncertainty is mental because it causes stress. There is a very clear link between being uncertain and feeling anxious. We understand! The solution to overcoming this uncertainty is simple: Become surer of yourself. Of course, that is easier said than done, but it is possible. For example, you can always talk to a personal trainer and arrange a few sessions. They can teach you how to use the equipment and show you what weights are a good starting point for your body. You can also talk to your athletic friends and ask them what they do in the gym. Maybe they will come with you and help guide you through a workout! Essentially, the secret is to find a way to feel more confident in the gym. At Circuit 31 Fitness, you don’t need to worry about planning your workout ahead of time. We set up a circuit for you to go through in just 31 minutes. We guarantee that none of our patrons feel uncertain about what to do. When going to the gym, it’s not uncommon to see someone who already has that dream body you want to work towards. That can be a little intimidating! This is because we use social comparisons to help us interact with each other. Where do we stand in relation to those around us? While this can be helpful in some areas of our lives, it’s absolutely terrible in the gym. If you constantly think you are falling short of those around you, that pressure will probably get you down quickly. Since comparisons are pretty natural, try to focus on making more positive comparisons. For example, take a look at these people and see how far you can grow. If you can avoid comparisons altogether, that’s an even better option. Psychologists recommend practicing “mindfulness” to help lower anxiety levels. In order to do this at the gym, focus on your own breathing as you lift. Think about the muscles you are activating with each motion. By focusing on the specifics, you won’t have the time or mental capacity to worry about those around you. First of all, you need to remember that people are at the gym to work out, not to watch you. We know it can be challenging to believe, but trust us. Everyone was a beginner at some point. Second, remember to focus on yourself! If, for whatever reason, someone does judge you, then that reflects poorly on them—not you. It’s common to assume that we know what others are thinking about us, but usually, we have no idea. These are strangers around you. These strangers would not have the time to work out if they were using all of their gym time to judge you! With that said, focus on yourself. Think about what you are doing, and everyone else will leave you alone. Some people believe they aren’t fit enough to go to the gym—which is absurd. After all, isn’t that the whole point? Instead, start small with things that will help you feel as if you belong. Wear proper gym clothes, and bring a water bottle. We promise that the feeling of not belonging does pass over time. The more you go to the gym, the more you will feel as though you belong. If you are looking for a new gym that will teach you exactly what to do and make you feel welcome from the start, then you’ve found it. We proudly offer a gym space to Allen residents where they can get a good workout in a short amount of time. Get the workout you need and then head on your way. To learn more, please contact us today! We look forward to seeing you soon!